A video of a cyclist behaving aggressively after being called out by a driver for nearly crashing into a pedestrian on a crosswalk is making its rounds on social media. 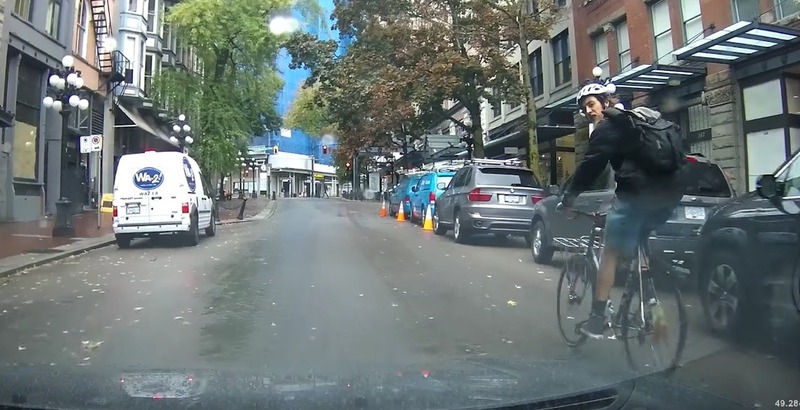 The dashcam video, posted onto YouTube and shared on Reddit, shows a cyclist travelling westbound on Water Street and failing to yield to pedestrians crossing the street at the crosswalk at Cambie Street. The cyclist barrelled through and nearly collided into a pedestrian at a high rate of speed. The driver then honks at the cyclist, who responds by looking back at the vehicle and giving him the finger. In the video description, the driver alleges the cyclist brandished a weapon as he passed by the car, but upon further examination it appears to be a smartphone. The video continues and shows the cyclist going through the red light at the intersection of Richards Street and Water Street. After the light changes, the vehicle catches up with the cyclist on West Cordova Street, and the cyclist is seen crossing the yellow line – into the oncoming traffic lane. He turns left onto Granville Street from the oncoming lane and disappears from view. Daily Hive has reached out to the Vancouver Police for comment on the dangerous cycling and aggressive behaviour. Cyclists have been involved in a number of incidents with pedestrians in recent years. In July 2014, a cyclist on the Stanley Park seawall crossed into the pedestrian lane at a corner and collided into an American tourist, who broke her back after falling 10 feet onto the rocks below. A few months later that same year, a 71-year-old man crossing Stanley Park Drive near the totem poles died after being struck by a cyclist. One year later, a cyclist allegedly failed to come to a halt at a stop sign and hit a pregnant woman. He then allegedly pushed and knock her over before leaving the area. According to the time stamp on the YouTube video, the latest documented incident occurred on the morning of October 10 this year.